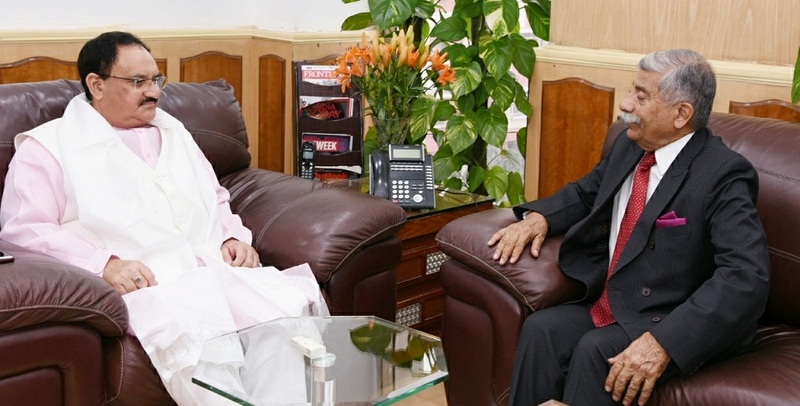 Arunachal Pradesh Governor BD Mishra with Union Health Minister JP Nadda. Arunachal Pradesh Governor Brig (retired) BD Mishra met Union Minister for Health & Family Welfare Jagat Prakash Nadda at New Delhi on Tuesday. The Governor, who is on an official tour to the national capital, took up the issue of the shortage of specialists in hospitals and healthcare units in Arunachal Pradesh. The Governor, who has been visiting hospitals and healthcare centers during his district tours, apprised the Union Minister about the deficiency of specialists in hospitals and healthcare centers in the State. The Union Minister was very appreciative of the issue and promised that his ministry would render all help in this regard to Arunachal Pradesh. In the meeting, the Governor suggested to the Union Minister that his ministry should help the State in getting specialist volunteers from other States in various fields of medical science, on deputation so that immediate problem of shortage of specialists in the State can be taken care of. Taking positive view on the suggestion, the Union Minister assured that his ministry would bear the cost and expenditure of the specialists who come to Arunachal Pradesh on deputation. The minister suggested that the process of advertisement asking for volunteers and procedure for engaging them should be done by the State Government. He added that for the procedure to be made effective, a proposal should be sent by the Arunachal Pradesh government to the Ministry of Health and Family Welfare. To make this scheme expeditiously effective, the Governor will apprise the concerned department of the Arunachal Pradesh government to do the needful. Earlier, Governor Mishra met Union Minister of State (Independent Charge) for Tourism KJ Alphons at New Delhi. They discussed regarding the potential of tourism promotion of the tourist attractions in the State, particularly Tawang and Parasuram Kund areas which are famous places for religio- cultural tourism of Arunachal Pradesh. While highlighting the tourism potential of the State, including eco tourism, cultural tourism, adventure tourism, religious tourism etc., the Governor emphasized that the development of tourism related places must be done in a holistic manner keeping in mind the approach road and connectivity to the place, site and destination. Hygiene, sanitation, medical care, security and accommodation for the pilgrims must be also taken care of. Sharing his observations during his recent visit to Parasuram Kund, the Governor also suggested for making arrangements for the pilgrims’ convenience for performing the rites and rituals. At the request of the Governor, the Union Tourism Minister promised to pay a visit to Arunachal Pradesh. The minister asked for proposals from the State Government to promote tourism in Arunachal Pradesh.